Today's post for me is a bittersweet one. One of our dear members of the SRC, Daniel Saraga of The Haggis and The Herring, passed away recently. His demise was an unexpected one. His wife Meredith posted a very touching eulogy which gives you an insight into the lovely person Daniel was. His passing came as a great shock to our group of bloggers. Even though I'd never met him personally, I teared up as soon as I read about this. It is amazing the bonds that blogging forms and nurtures. Daniel was a cheerful spirit and I know he will be greatly missed. As part of a tribute to honor him, the SRC members have come together and decided to showcase a recipe from his blog. I was pressed for time, but I wanted to be a part of this tribute. So I picked a sandwich for today's reveal. Even though this humble sandwich is so simple to put together, it is absolutely delicious. Further more, it is extremely versatile, so you can easily switch things up to suit your preferences. 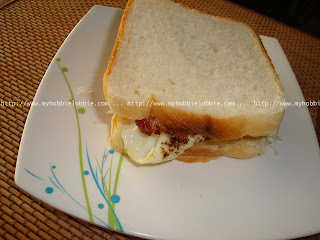 I made this for breakfast today and I know that this sandwich will feature now and again at our breakfast table. So here's to Daniel and his wonderful family. Meredith, our thoughts and prayers are with you and your family during this trying time. Spread a little butter on one slice of bread. Place the egg and the rashers of bacon over it. Place the grated cheese over the eggs and bacon. Pour a few drops of Thai Sriracha sauce over it. Use this hot sauce to taste. On the other slice, spread some tomato ketchup and top the sandwich with it. Sit back and enjoy with a steaming hot mug of coffee. Looks like the perfect breakfast! Lovely tribute. You are so right about the blogging bonds. We all feel like we know each other and Dan will be truly missed in our group. Nice tribute to Dan and one of his favorite sandwhiches. Sounds like a delicious breakfast, and it's a beautiful tribute. My heart breaks hearing this news. What a beautiful tribute and delicious breakfast option. Nice for you to be able to participate. So unexpected and tragic to lose someone like this. Everyone here would love this breakfast sammie. A delicious sandwich and a perfect tribute to Daniel. Great pick for a busy morning and a tribute to the community Daniel nurtured. Thank you for this great tribute to my brother Dan. I understand what you mean about being part of the blogging community. You guys have showed me how much of an impact you all have on each other by going through with this tribute. Thank you for stopping by. You and your family are in my thoughts and prayers.